Hot Folders can be configured on local computers so when items are placed into that folder, they will periodically get imported into the corresponding folder in Zoom. Pre-scripts can be configured to run processes on files before executing the import. Metadata can also be applied to assets during a hot folder import. Select the server to import the ingested assets to. Under Authenticate Import, input your Username and Password. It is recommended that you configure a separate dedicated user account for the Hot Folder ingest operations. If you use your own user account, which you would typically use for say, browsing from the Asset Browser, then every time the Hot Folder ingest runs, your Asset Browser session will be logged out. Due to the Zoom named user license model, a single username account can only have one active session at any given point in time. Click the Hot Folder Settings section in Zoom Settings. Under Import to, click the Select button. Choose your folder in Zoom to import the assets into. Under Hot folder path, click Browse button. Navigate to the folder on your local computer you want Zoom to monitor. 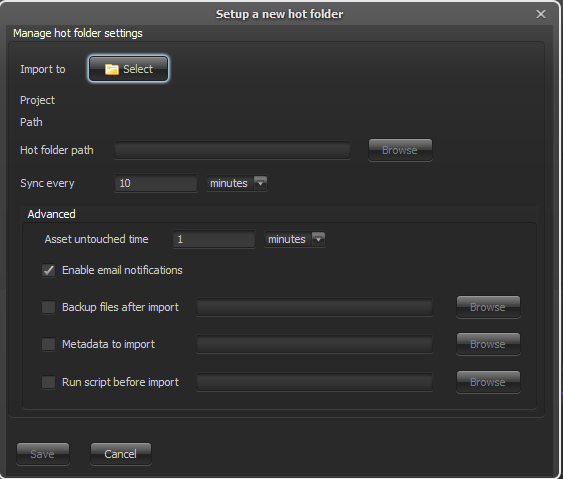 Click the checkbox corresponding to your Hot Folder in the Hot Folder List. Made edits to your Hot Folder. Enables notifications by email about the details of each periodic ingest happening through this hot folder. Under Enable email notifications, click the checkbox. Under Notify them after import, list the email addresses or an alias of users you would like to notify, separating each with a comma. Under Backup files after import, click the checkbox. 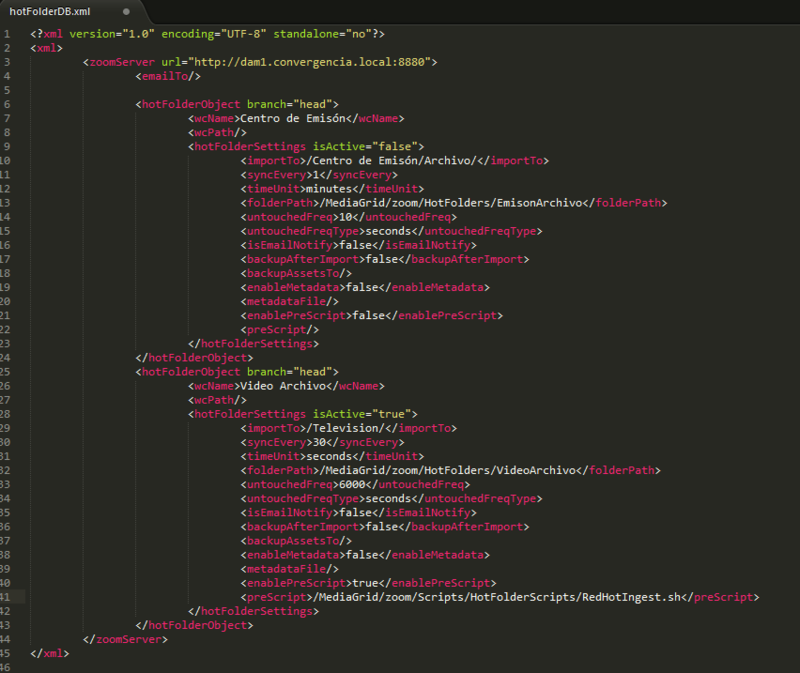 Specify the directory to move files to after import. Moves files in Hot Folder after they are successfully imported into the specified folder. Specifies which metadata will be applied to assets automatically when imported into Zoom. To set which metadata to add to files as they are imported, a text file with the different values must first be set. Create a new text file using your preferred text editor. Notepad, TextEdit, Notepad++, BBEdit, etc. For each metadata value you would like to apply to files, create line with [GroupCode]_[MetadataLabel]=[Value], replacing [GroupCode] with the Metadata Group Code your value is stored in, the [MetadataLabel] with the Label of the metadata field, and [Value] with the value you would like to set for that metadata field. Save your file on your computer. Under Metadata to import, click the checkbox. Specify the metadata text file to read metadata values. Controls which files present in the hot folder are actually eligible to be imported. Any file that has been modified within the time specified in this field will be treated as being currently modified, and therefore deemed as partial files. Such files will not be ingested. Since the hot folder mechanism runs periodically, this check will continue to happen and at some point, the files will be fully written and will become eligible for import. Enter the time interval that might normally take for files to get written into your configured hot folder from any external processes. This is the time Zoom will wait, before picking up that file for importing into the repository. Runs specified script before import to allow for automation during the import process. Under Run script before import, click the checkbox. Specify the script to run before import. The script is dependent on it being executable on your system. The script can directly import assets by invoking the Zoom import command, in that case, delete the assets in the script before it finishes to avoid the Hot Folder periodic ingest from trying to import again. To understand a sample Hot Folder ingest script, check out this article here. Currently, on Linux, only Zoom server build is available because Linux does not support the necessary UI libraries required to run a full-fledged Zoom client. However, it is possible that one may want to set up and access the command line Zoom client, for example, to set up Hot Folders. 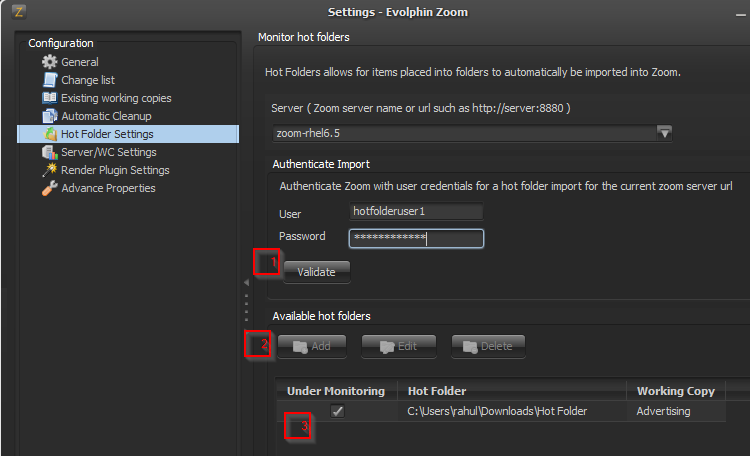 Set up hot folder settings on another machine including the steps to authenticate the hot folder user. Copy the $HOME/.zm/ contents of that machine over to the headless Linux server’s $HOME of the user the Zoom client proxy is set up to run-as. Edit the .zm/settings/hot_folder/hotFolderDB.xml to point to the correct disk location from where to conduct the ingest into the Zoom server. Download a copy from here. For guidelines on how to automate processes tied to hot folder ingests, please read this article.